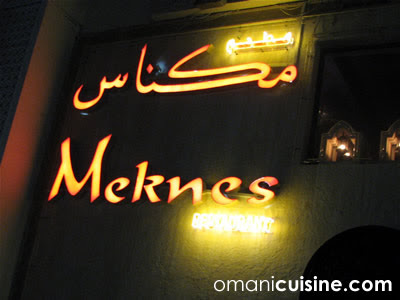 Meknes (proper Arabic pronunciation is Mik’naas) is a Moroccan cuisine restaurant located in Al Khuwair, it is two blocks after the Oman Mobile headquarters if you are coming from Muscat – its flashy sign cannot be missed. 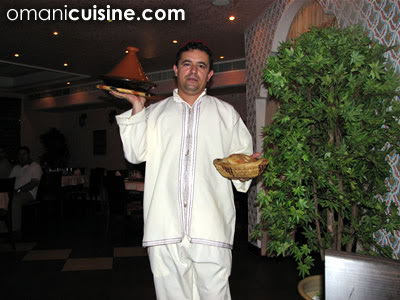 Meknes is a proper restaurant suitable for business dinners and special events. It’s very well decorated and looks quite fancy. The place is bigger than what it looks from the outside as the upper floor spans across multiple units. The restaurant has a semi-separate sheesha joint on its other side, we did not see any smoke or smell any sheesha during our stay, but I do not know if that was because the sheesha place was well isolated or because they had no customers in it at that time. There isn’t a non-smoking section in the restaurant, but the place is very spacious and did not have many actual customers when we were there, so again, we do know how it would have looked like in a busy/bad day. There are a couple of cabinet-like rooms in which people could dine in if nobody else was already in there. For main courses, Meknes had mixed grills, fish grilled on coal, cuscus with vegs and chicken, cuscus with vegs and meat, chicken with olives and lemon, chicken with nuts, and about 15 other dishes with funny names that made no sense to us (eg. Ø¨Ø³Ø·ÙŠÙ„Ø© – Ø¨Ø§ÙŠÙ„Ø§ – Ø·Ø§Ø¬ÙŠÙ† – Ø±ÙÙŠØ³Ø©). 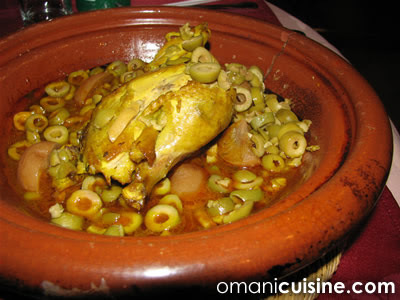 I had chicken with olives and lemon (image below) which came with three huge buns of sweet spongy bread. I do not know how to eat with that sort of bread, I tried tearing crumbs of the bread and eating the chicken with it, it was hard and I really couldn’t taste the flavour of the chicken because of the sweet bread. I eventually gave up and started using the cutlery to eat the chicken with the sauce and managed to actually enjoy the meal, the chicken was very tasteful and very well cooked. I enjoyed it, it was good, but as I person who likes spicy food, I did not think that it was mind blowing. 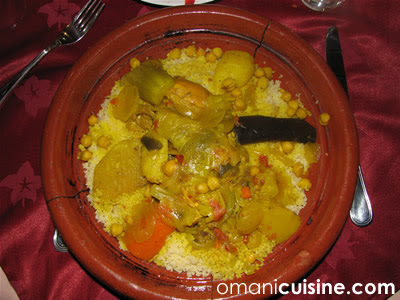 My friend had cuscus with vegetables and chicken, he thought it was very good. We thought that the quantity of the food was a lot for a single person, especially if you are going to have a three course meal. Meknes also offers fresh juices, soft drinks, special Moroccan tea, and a coffee. They have a weird selection of desserts and sidelines that we did not try. Actually, we were very boring and only had the Omani survival drink, Mountain Dew. 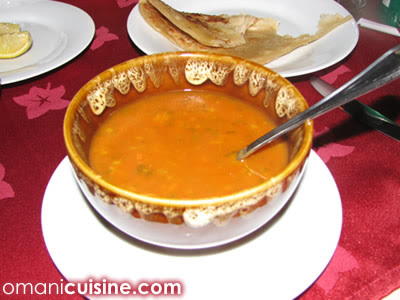 Starters in Meknes cost from RO 0.8 to RO 1.5, meal courses cost RO 2.5 to Ro 3.5, there are special discounts for ordering larger dish for two or more people, drinks cost about RO 1 and desserts about the same. We paid around RO 12 for our meal. 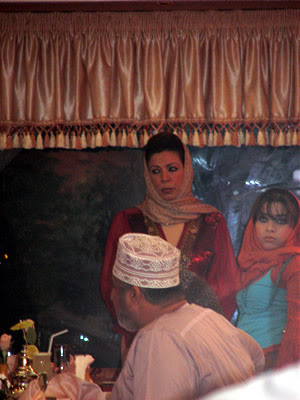 A funny thing that happened was that they were shooting an Omani TV series in Meknes on the day that were there, it was hilarious, Omani super star Fakhriya Khamis was there, so we thought we’ll play paparazzi and take some photos, of course it is not as exciting as shooting Beyonce on a nudist beach.. or well, it actually could be on Omani standards. Content on this website is licensed under a Creative Commons Attribution-NonCommercial 3.0 License.